I’m the Rare Books and Humanities Librarian at the University of Tennessee, Knoxville. Indirectly, as a poetry student in San Francisco, prior to my life as a librarian. I spent a lot of time researching and working with poets, learning about poetry culture and underground publishing. Secret Location on the Lower East Side kinds of stuff. I studied the basics of librarianship here at Tennessee in the School of Information Sciences and supplemented heavily with Rare Book School, the Book History Workshop at Texas A&M, Colorado Antiquarian Book Seminar, and other places. For several years I was the general-duty subject liaison to the Departments of English, Theatre, and the Humanities Center. I occasionally taught with rare materials in that role, but I gradually took on more duties in our special collections department: exhibition curation, collection development, donor relations, etc. From this summer I’ll be focusing on rare books almost exclusively. “The last item I handled” is always a safe answer. This morning it is the four issues of Thomas Merton’s cheaply produced little magazine Monks Pond, from 1968. This afternoon it will probably be an artist’s book that I’m expecting to receive today from a Tennessee creator. Or maybe the 16th century Spanish psalter in manuscript that I’d like to pull for a visiting researcher. I’m very fond of our signed copy of Phillis Wheatley’s Poems on Various Subjects, Religious and Moral (1773), which I helped bring to the collection. The role of rare books librarian is wonderfully varied and indulgent. In my San Francisco years it was poetry chapbooks, but in recent years I’m fond of pre-WWII travel and culture guides to Japan. I’ve slowed down though, as I get the luxury of collection-building at work. I also like Japanese incense, and feel confident that I have more varieties than anyone by many miles. I like the ephemerality of it. Family time, mostly. Six times a year I get into the Grand Sumo Tournament from Japan. It’s been far too long, but I do enjoy papermaking and working with my small tabletop printing press (Watson’s Young America). The visceral “a-ha” moments of students and researchers, followed by a gradual, deeper awareness of how all of this rare materials business fits together in our troubled, wonderful world. That’s what keeps us coming in to work, I think. And limited time, staffing, space, and money aside, there are seemingly endless permutations of what one might try pedagogically and outreach-wise. And the free exchange of information with social media, and such, is as refreshing as it is overwhelming. It is heartening to see more early career librarians-in-the-making show an interest in rare materials. There’s no shortage of jobs for them if the profession can get the universe in balance staffing-wise and budget-wise, and that is going to take a lot of self-advocacy. There is a lot to be excited about, and much more work to be done, so the joys are greatly valued on this rocky road. It’s still a struggle, at times, to break from the old habits and perceptions, silos, standoffishness. To reach our full potential with accessibility and diverse collections we seriously need to increase staffing and think more creatively about curation and outreach. We have a great, and growing, team and we need all the help we can get to keep up with the demands of researchers and students. This is on top of the usual demands to prove our value to the academic community, etc. We see hundreds of students a year and I feel like we cultivate a strong open-door policy with programming, but I still encounter people who are not sure that we are open to them. I’m pushing for more neon arrows to guide people in. The wish for “more” may be a bit of a pipe dream, but enhanced resources would definitely help us to be more proactive than reactive, and hopefully actualize a wiser, more philosophical approach to what we do. But, at this point, how on earth could we increase traffic and happily serve everyone? It’s an interesting tension, and one that we need to talk about more efficiently to remedy, I think. We’ve not had the luxury of a dedicated rare book librarian in a number of years, so I’m hoping to make plain more of the currents in our rare book collections. We get a lot of wonderful mileage out of the collections that you might expect: Great Smoky Mountains Regional Collection, Cherokee material, Civil War, Tennessee authors, for example. But we also have some wonderful 19th century Victorian material that we received from Patricia Cornwell, an impressive civil rights collection in book and manuscript, a growing collection of artists’ books, a great array of medieval facsimiles, and fascinating material on moonshine, witchcraft, and other areas. With more time to focus on rare books, my hope is to promote these more efficiently in the coming days. We’ve recently upgraded our reading room, instruction space, and exhibition space, so we usually have four or five themes on exhibition at once. We take turns curating and my next large exhibition will be in spring of next year, focusing, broadly, on theatre. I’m planning to highlight our John C. Hodges Collection of William Congreve materials from the 17thcentury and the decades of award-winning production work by our Clarence Brown Theatre, especially from the design teams. Imminently, we have our second installment of the Boundless: Artists in the Archives performance, which gets creatives in to special collections to generate original work based on our material. We always have something interesting on, and we work convivially in the dash to get things launched. That sense of camaraderie in the workplace makes a tremendous difference. I'm the Rare Books and Humanities Librarian at the University of Tennessee, Knoxville. Indirectly, as a poetry student in San Francisco, prior to my life as a librarian. I spent a lot of time researching and working with poets, learning about poetry culture and underground publishing. Secret Location on the Lower East Side kinds of stuff. I studied the basics of librarianship here at Tennessee in the School of Information Sciences and supplemented heavily with Rare Book School, the Book History Workshop at Texas A&M, Colorado Antiquarian Book Seminar, and other places. For several years I was the general-duty subject liaison to the Departments of English, Theatre, and the Humanities Center. I occasionally taught with rare materials in that role, but I gradually took on more duties in our special collections department: exhibition curation, collection development, donor relations, etc. From this summer I'll be focusing on rare books almost exclusively. "The last item I handled" is always a safe answer. This morning it is the four issues of Thomas Merton's cheaply produced little magazine Monks Pond, from 1968. This afternoon it will probably be an artist's book that I'm expecting to receive today from a Tennessee creator. Or maybe the 16th century Spanish psalter in manuscript that I'd like to pull for a visiting researcher. I'm very fond of our signed copy of Phillis Wheatley's Poems on Various Subjects, Religious and Moral (1773), which I helped bring to the collection. The role of rare books librarian is wonderfully varied and indulgent. In my San Francisco years it was poetry chapbooks, but in recent years I'm fond of pre-WWII travel and culture guides to Japan. I've slowed down though, as I get the luxury of collection-building at work. I also like Japanese incense, and feel confident that I have more varieties than anyone by many miles. I like the ephemerality of it. Family time, mostly. Six times a year I get into the Grand Sumo Tournament from Japan. It's been far too long, but I do enjoy papermaking and working with my small tabletop printing press (Watson's Young America). The visceral "a-ha" moments of students and researchers, followed by a gradual, deeper awareness of how all of this rare materials business fits together in our troubled, wonderful world. That's what keeps us coming in to work, I think. And limited time, staffing, space, and money aside, there are seemingly endless permutations of what one might try pedagogically and outreach-wise. And the free exchange of information with social media, and such, is as refreshing as it is overwhelming. It is heartening to see more early career librarians-in-the-making show an interest in rare materials. There's no shortage of jobs for them if the profession can get the universe in balance staffing-wise and budget-wise, and that is going to take a lot of self-advocacy. There is a lot to be excited about, and much more work to be done, so the joys are greatly valued on this rocky road. It's still a struggle, at times, to break from the old habits and perceptions, silos, standoffishness. To reach our full potential with accessibility and diverse collections we seriously need to increase staffing and think more creatively about curation and outreach. We have a great, and growing, team and we need all the help we can get to keep up with the demands of researchers and students. This is on top of the usual demands to prove our value to the academic community, etc. We see hundreds of students a year and I feel like we cultivate a strong open-door policy with programming, but I still encounter people who are not sure that we are open to them. I'm pushing for more neon arrows to guide people in. The wish for "more" may be a bit of a pipe dream, but enhanced resources would definitely help us to be more proactive than reactive, and hopefully actualize a wiser, more philosophical approach to what we do. But, at this point, how on earth could we increase traffic and happily serve everyone? It's an interesting tension, and one that we need to talk about more efficiently to remedy, I think. We've not had the luxury of a dedicated rare book librarian in a number of years, so I'm hoping to make plain more of the currents in our rare book collections. We get a lot of wonderful mileage out of the collections that you might expect: Great Smoky Mountains Regional Collection, Cherokee material, Civil War, Tennessee authors, for example. But we also have some wonderful 19th century Victorian material that we received from Patricia Cornwell, an impressive civil rights collection in book and manuscript, a growing collection of artists' books, a great array of medieval facsimiles, and fascinating material on moonshine, witchcraft, and other areas. With more time to focus on rare books, my hope is to promote these more efficiently in the coming days. We've recently upgraded our reading room, instruction space, and exhibition space, so we usually have four or five themes on exhibition at once. We take turns curating and my next large exhibition will be in spring of next year, focusing, broadly, on theatre. 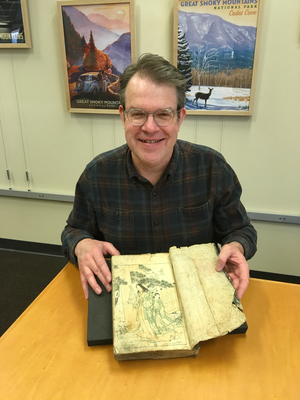 I'm planning to highlight our John C. Hodges Collection of William Congreve materials from the 17thcentury and the decades of award-winning production work by our Clarence Brown Theatre, especially from the design teams. Imminently, we have our second installment of the Boundless: Artists in the Archives performance, which gets creatives in to special collections to generate original work based on our material. We always have something interesting on, and we work convivially in the dash to get things launched. That sense of camaraderie in the workplace makes a tremendous difference.